Frequently referred to as ‘Scotland in Miniature’, Arran has some seriously impressive geography and geology. Half is dramatically mountainous and sparsely populated and half is green and flat. The coastline is borderline spectacular. It also has some seriously good food, a brewery and a distillery. When it comes to the best places to stay on Arran our Gurus recommendations highlight the many different aspects of this lovely island. Brodick Castle is the obvious headliner, it’s very photogenic as well as being historic. It was built in the 13th century, then converted into a more comfortable stately home and used by the Dukes of Hamilton into the 50s. Expect deer heads and horse ’n’ hounds paintings. Lochranza Castle is a ruin and the setting is dramatic and atmospheric. Goat Fell is the highest mountain on the island and is a half day hike offering summiteers views of the Ayshire and Galloway coasts and the islands of Bute and Jura. The Arran Brewery is at the base of Goat Fell and they’ll do you a free beer tasting. They have a very nice restaurant. Nearby Holy Island is worth a visit - the boat leaves from Lamlash. It’s always been considered spiritually important and has been home to monks and saints. Today a community of Buddhist monks live there after a vision of the Virgin Mary persuaded the previous owners to sell the island to them. As well as the Tibetan monks Holy Island is also home to rare animals and wild sheep and ponies. Whiting Bay is a pretty village with a beautiful white sandy beach. Delightfully quaint, there’s a putting and bowling green and some boutiques and galleries. Prinmill is another nice village, probably best known for being close to one of the island’s best beaches. Kildonan has a lighthouse and some lovely rock formations. Machrie is close to Machrie Moor where you can see some of the island’s best known standing stones and stone circles, though you’ll see lots all over the place. Arran is also known for seals and birds of prey, so don’t forget to keep your eyes open for them as well. You could come to Arran and stay in some scenic spot and just relax, but it’s a great place for explorers, travelling on foot, on two wheels or four. Hikers love the challenges of the mountainous north and cyclists love the coastal road. With all this diversity it is no wonder that the best places to stay on Arran are quickly snapped up so do book well ahead. 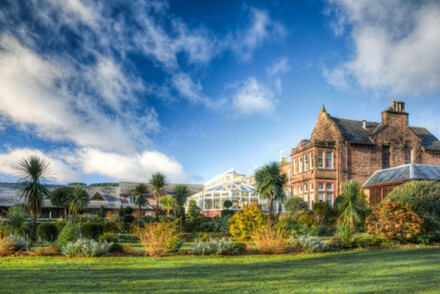 The Auchrannie House Hotel has been converted from a beautifully sprawling estate property close to Brodick. There are 84 contemporary rooms and plenty of activities laid on onsite, plus a spa and stunning scenery. When you come home there are fires lit and a modern restaurant. The Glenisle Hotel is a boutique-style hotel with 13 charming bedrooms, a beautiful walled garden, fantastic bistro and an incredible setting. Glasgow Airport is the closest airport, and from there you need to travel to Ardrossan - there’s a bus service - which is where the ferry to Arran leaves from. It docks in Brodick. There’s a big Folk Festival in June, so come, or avoid, depending on your taste in music. But summers are the most popular time to visit, offering the easiest crossings and the best weather. Obviously the best deals for accommodation are in the cooler months, but it does get pretty cool up here. Consider another island? Maybe Skye or Harris? Or the 10 best UK island hotels? Set on the beautiful island of Arran over a sprawling estate. Contemporary rooms make for a comfortable stay with plenty of fire lit areas for lounging after an action filled day. A spa, countless activities for adults and children alike and modern cuisine make this the ideal family get away. 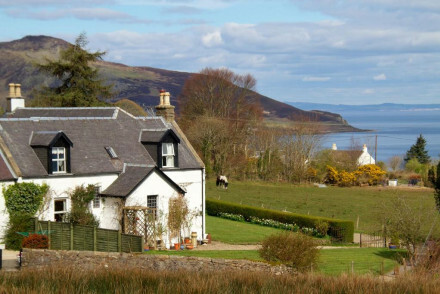 A boutique B&B on the stunning island of Arran. Situated on the coast and set in mature gardens this is true rural escapism. Lovingly converted throughout, each room is decorated in soft hues and has a contemporary, yet cosy feel. Expect indulgent breakfasts, roaring fires and an extensive library. Hideaway - A secluded island property, perfect for getting away from the hustle and bustle of city life. Great walks - The picturesque rugged landscape makes for excellent walking country. Sailing - Hire a boat and explore the island from the sea. 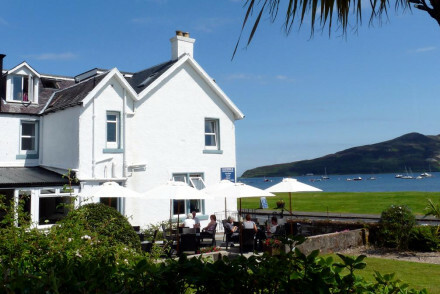 The charming Glenisle Hotel enjoys a splendid location in Lamlash, on the Isle of Arran. Come for chic, well equipped rooms & suites with great sea views, and a walled garden for relaxing with a drink. The bistro (specialising in seafood) is excellent & open all day. A fantastically scenic retreat.